This is a beautiful teak temple that was once part of the royal palace area of Mandalay Fort. 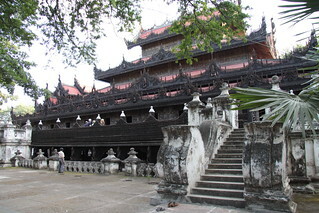 It was disassembled and moved to the present location in Mandalay in 1880. The walls are covered with teak carvings, many of them in extremely poor condition.